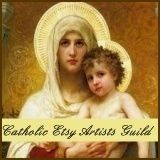 Catholic art is basically made to be contemplated, its symbols conveying deep truths about salvation. 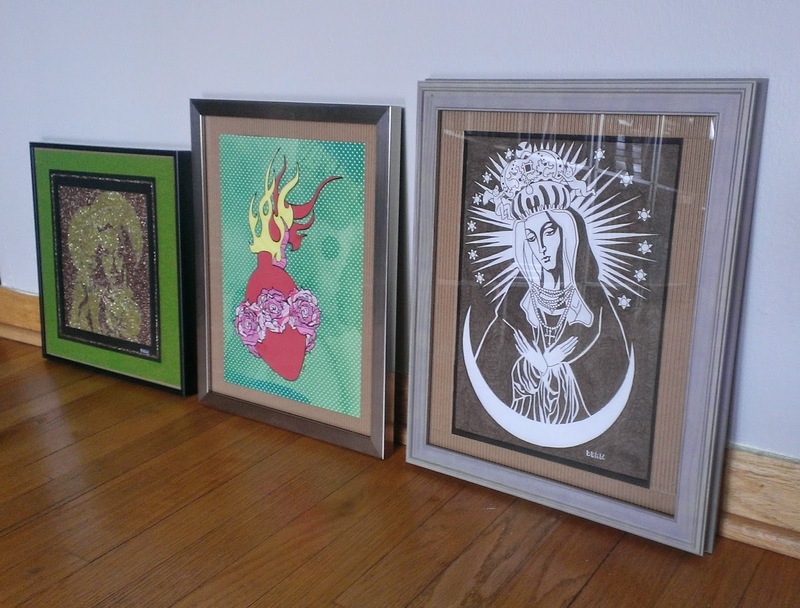 Whether with holy cards or Holy Icons, there is much to be gained from meditating on their imagery. One of the beautiful things about being a Catholic artist is getting to combine meditation with production. Whenever I set out to make a new piece, I like to investigate the stories behind the pictures -- to learn more about the meaning behind their symbols. Thus, I am contemplating the images even as I am producing them. Take, for example, the Immaculate Heart of Mary. 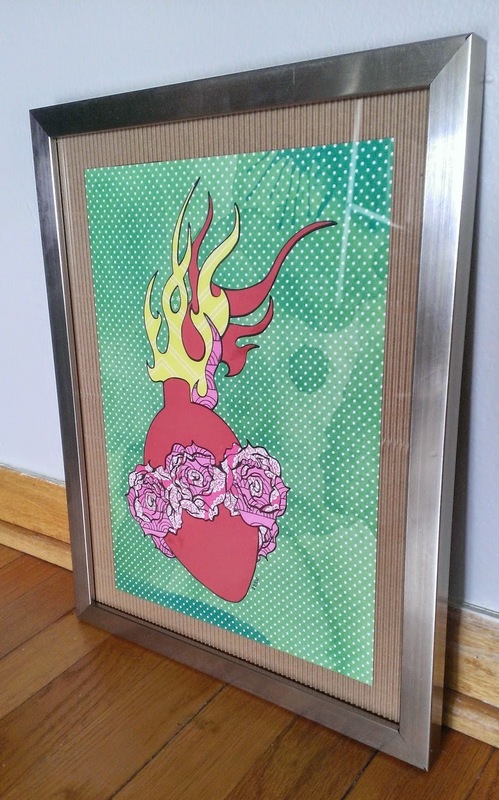 I wanted to understand the significance of the roses around Mary's heart, and this is what I learned... Mary’s roses represent her purity and her status as Mystical Rose of heaven. It is said that when Mary was assumed, a bed of roses appeared where her body had been. When she revealed herself to St. Juan Diego as Our Lady of Guadalupe, she caused out-of-season roses to bloom. And when she appeared to St. Bernadette at Lourdes, she had a rose upon each of her feet. Then, there's Our Lady of Ostrabrama. Mary humbly bows her head, her hands crossed piously before her chest. Her halo emanates rays like the sun, and twelve stars encircle her head. She appears as she does in Revelation Chapter 12. She wears one crown, while tiny angels place a second crown atop the first. “Gate of Dawn” was the name of the southeastern entrance to the city. The original painting hung there in a niche, even before there was a chapel. In the intervening years, it has survived invasions by Russians, anti-Catholic Swedes and Nazi Germans; two devastating fires; and being shot. Our Lady is the Queen who can't be deposed! In 1927, Pope Pius XI gave the image the additional title Mater Misericordiae (Mother of Mercy). Then, in 1935, St. Faustina’s first commissioned Divine Mercy Jesus painting debuted in the southeastern chapel next to Our Lady of Ostra Brama. 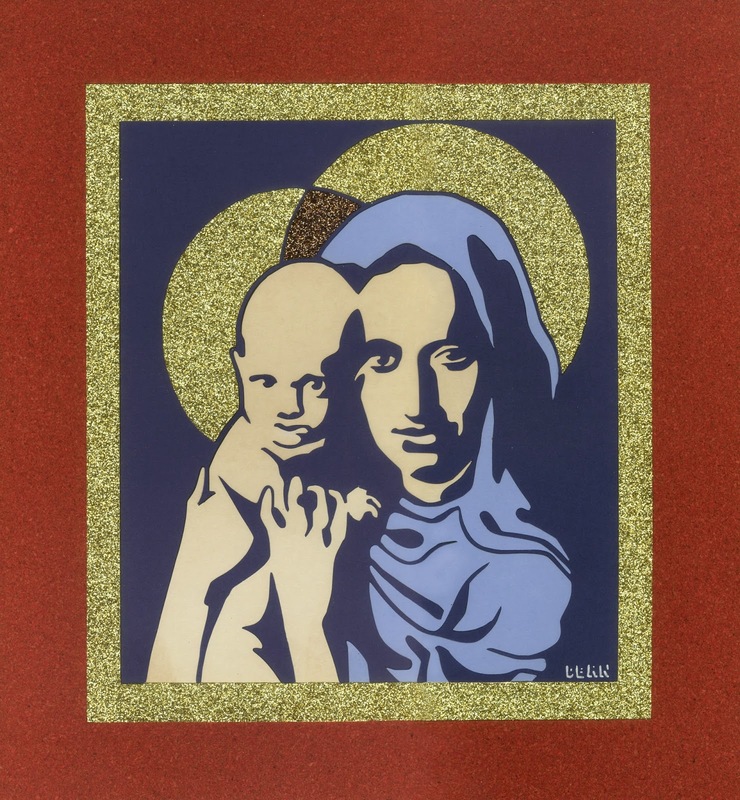 The two images associated with mercy were revered together, Mother and Son. 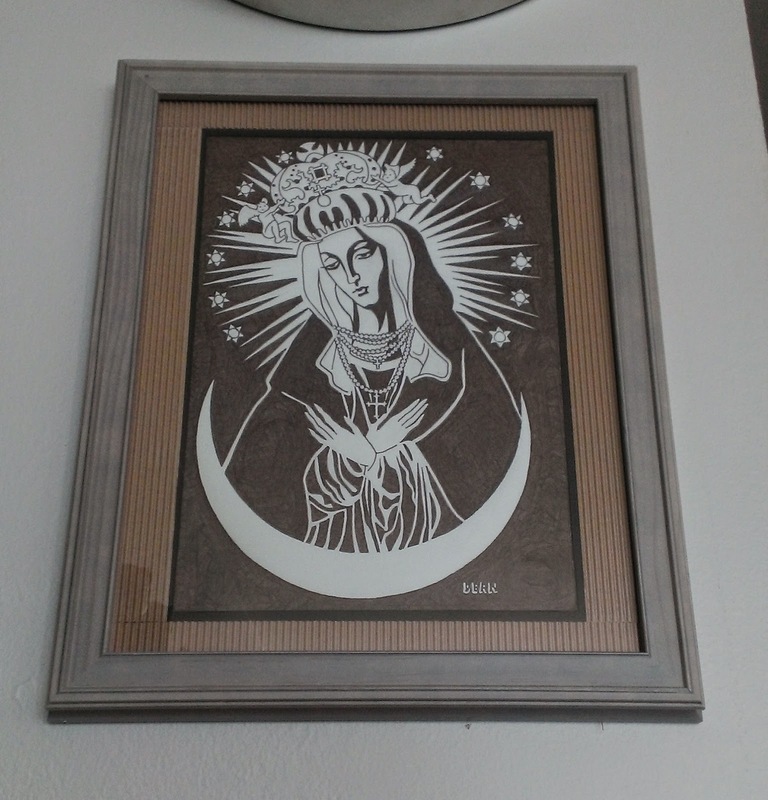 And that is how my framed postcard of Our Lady is displayed on my desk: next to a framed Divine Mercy Jesus print. 80 years later, these two images are reunited! I never would have known there was a connection between these images if I had not wanted to delve deeper into their meaning. And that is why I am so thankful to be a Catholic artist! They say that drawing is the basis of art. I don't know if they are right, but I do know that my personal art exploration began with doodles I made while lying on the floor of my bedroom. I was three years old. Many years have passed, and I still enjoy the immediacy and simplicity of drawing. But I have also come to revel in the excitement of translating a drawing into another medium. For the past few months, I have been exploring the medium of collage. I have a cutting machine that follows the exact contours of my drawings, so it is easy to try out different colors and textures of paper. These are a couple of pieces currently available in my Etsy store. The first is entitled Immaculate Conception. 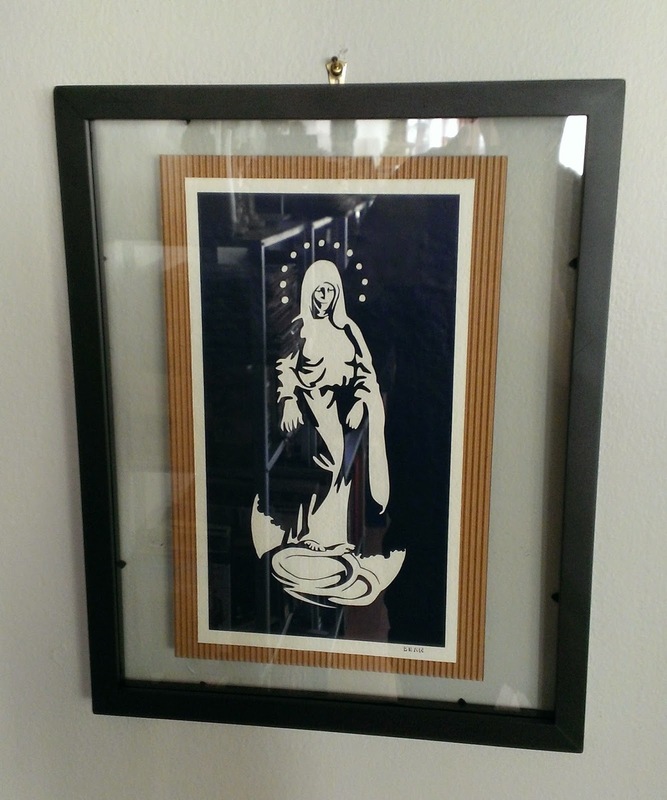 Here, Mary is cut out of navy blue vinyl. The scene is mounted on white cold press paper, and the paper is mounted on brown corrugate. I adore this combination of color and texture, and it obviously did not occur to me until I had translated my original drawing to collage! 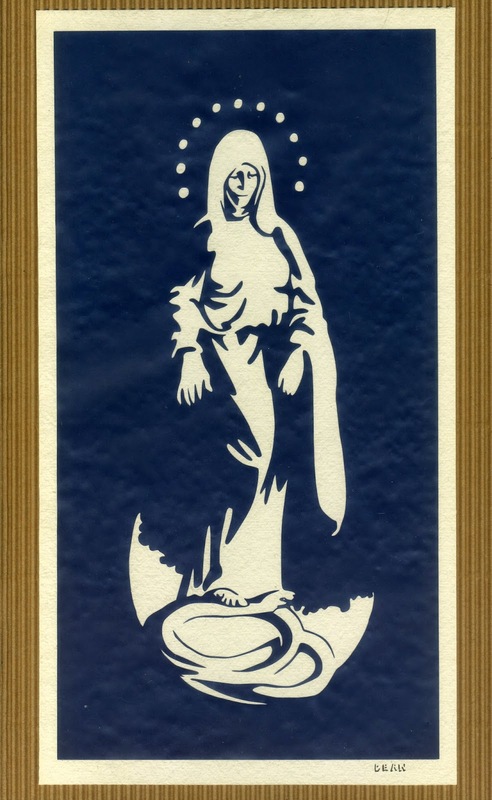 You will recognize this image as the Immaculata, with Mary standing on a crescent moon. She crushes the head of the serpent, as foretold in Genesis Chapter 3. Twelve stars circle her head like a crown, as they do in Revelation Chapter 12. 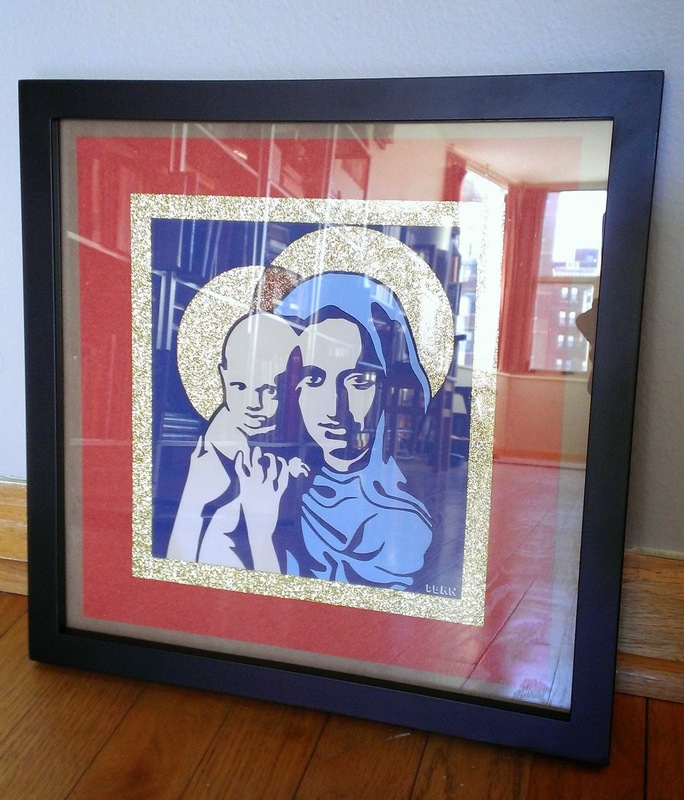 The second piece is entitled Holy Mother and Child. I used multiple paper types to differentiate the flesh, fabric and halos. The entire image is mounted on red cork. The contrast between the hot press paper, the glitter-paper and the cork is pleasing. The primary colors work nicely together, and the red could be seen to foreshadow the Passion. This is a possibility that was not remotely apparent when I began with a black and white drawing. The little child makes me think back once more to the three-year-old boy who sat on his bedroom floor and made drawings of the pictures in his head. Guess what? He's still happily working!